Well most of us are enjoying some of the best snow in years on our snowmobiles. 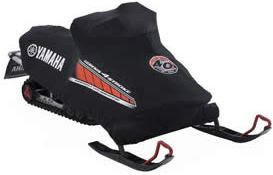 What better way to protect your investment when trailering it to the cottage or trails than a Yamaha snowmobile cover. Yamaha snowmobile covers are custom fitted for your machine and have a special urethane coating to keep moisture out, but still breathe, protecting your painted surfaces enabling your snowmobile to look great for years. The Deluxe blue cover comes complete with a protective cover for the windshield and is preshrunk for a snug fit to prevent flapping when transported on an open trailer. Fits the Apex LTX, RTX, ER as well as the RS Vector LTX, GT models.